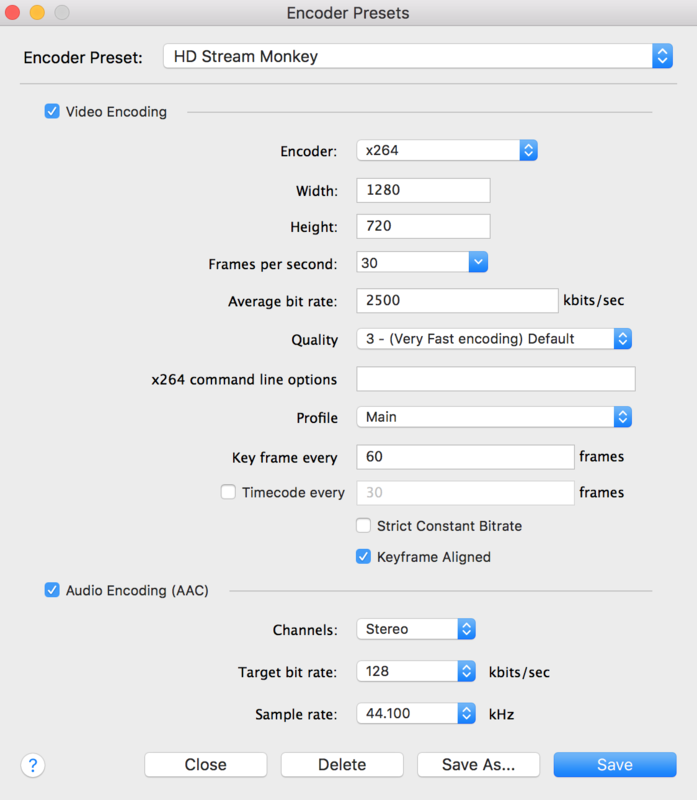 Select RTMP Server for a live stream. Name the stream so you remember what it is. I suggest naming it something simple like "Stream Monkey." You will then want to set up your own encoding presets. Click on the settings button next to the encoding box. If you are using the transcoder, you'll just be sending one stream, so we recommend doing the 1280x720 or the 1920x1080, depending on your plan. Please note that 1080 does cost extra, so if that is not included in your plan, you need to stream in 720 or contact us to add it to your plan. The address needs to be the address from the stream you have set up on the Stream Monkey site. You can find it under Live Streams, then by clicking on the Details button on the stream you would like to use. If you click directly on the address listed, it will copy it to the clipboard for you. Paste the address into the address box. In the Stream box, you will need to paste the Stream Name from the Stream Monkey Dashboard (see above photo). It will be something simple, just the name of your stream. You do not need to enter any credentials, we will handle that part for you. Once all that is complete, you are done with your outputs! Once your signal is up and running for at least 45 seconds, you can go to the Stream Monkey site and click on “Preview” next to your stream to make sure that the signal is sending and that it everything looks clear. Double check to make sure that it is creating the additional bitrates for you as well.